Who will be the next U.N. climate chief? U.N. climate chief Christiana Figueres (center), who shepherded a global agreement into creation last year, has announced she will step down. Observers say the next head of the U.N. Framework Convention on Climate Change will have to bridge a gap between developed and developing nations. Photo by Francois Mori, courtesy of AP Images. Christiana Figueres' announcement that she will step down this summer as head of the U.N. Framework Convention on Climate Change has sparked speculation about who might fill her shoes and help set the Paris climate agreement in motion. The coming months will see countries nominate potential replacements for Figueres, to be vetted and assessed by U.N. Secretary-General Ban Ki-moon with consultation with parties. Already, though, observers are floating names from U.N. senior climate adviser János Pásztor to Youba Sokona, the Malian vice chairman of the Intergovernmental Panel on Climate Change, as possible candidates. Experts said whoever replaces Figueres will face steep challenges. On the one hand, the candidate must be steeped enough in the issue of climate change to oversee implementation of the agreement that parties reached on Dec. 12, 2015. On the other, he or she must possess enough diplomatic ability to serve as the public face of the U.N. climate process and to coax and prod parties to voluntarily increase the ambition of their targets before 2030. "The executive secretary has huge responsibility and no authority, making it one of the most difficult jobs in the world," said U.N. Foundation Vice Chairman Timothy Wirth. 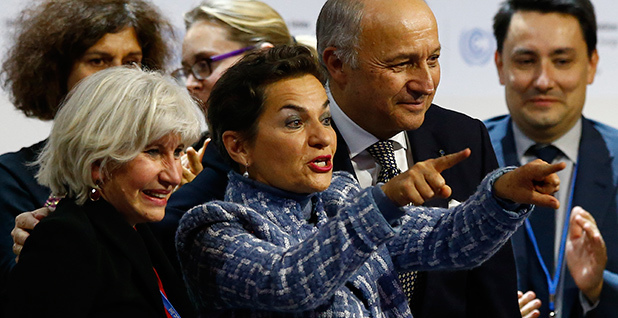 Figueres, who brokered in Paris what promises to be the first truly global deal to combat climate change, announced in letters earlier this month to parties that she would not accept an extension of her six-year term as executive secretary of the UNFCCC (Greenwire, Feb. 19). The letters were made public Friday. The December agreement doesn't arm Figueres' successor with many enforcement tools. It's built on voluntary commitments from countries rich and poor, and a process whereby those commitments should become more ambitious by five-year increments. But the future of the United Nations' multilateral process -- and of global climate safety -- depends on nations' willingness to make good on those commitments and collectively raise them to achieve Paris' long-term target of limiting warming to well below 2 degrees Celsius over preindustrial levels. So whoever follows Figueres will need skills to succeed. "They need to be someone who's deeply familiar with both the substance and the politics of the issues, and of the U.N. process," said Alden Meyer, director of strategy and policy for the Union of Concerned Scientists. Names of some potential successors were drawn from within the United Nations itself. Wirth said he thought the secretary-general would do well to recruit Achim Steiner, the current head of the U.N. Environment Programme, who is preparing to leave his post in June, one month before Figueres' departure. The German-Brazilian has "a foot in both camps" of the U.N. divide between developed and developing nations, and his deep knowledge of global environmental policy would aid him in implementing the Paris agreement, he said. Sokona, a vice chairman of the IPCC and executive secretary at the Tunis-based Sahara and Sahel Observatory, was also mentioned. The Malian heads an organization devoted to harmonizing development and environmental concerns, an important theme in Paris implementation in the developing world. Another name to surface was that of Pásztor, who spent last year advising Ban in the runup to the Paris talks. The Hungarian government nominated the former World Wide Fund for Nature International official to replace outgoing Executive Secretary Yvo de Boer in 2010. Other 2010 nominees included Tariq Banuri of Pakistan, currently a professor of economics at the University of Utah; Marthinus van Schalkwyk, former minister of tourism for South Africa; and Vijai Sharma of India, who twice served in top positions in the environment ministry and helped craft the 1997 Kyoto Protocol. Figueres, a former Costa Rican negotiator herself, was well-versed in the conflicts and divides that had long plagued the U.N. climate process. Those resulted in the Kyoto Protocol only covering a limited set of countries and the 2009 Copenhagen, Denmark, summit collapsing with no deal. She was praised last week for having built bridges between countries, helping to improve key bilateral relationships and bringing more businesses, local governments and other players into the process. "Christiana was tireless, shrewd and effective, urging, prodding, cajoling, never losing faith," said Todd Stern, U.S. special envoy for climate change. "She insisted on ambition and inclusion, stayed upbeat against every setback, treated failure as a non-option and success as an imperative. "She did a remarkable job," he said. Experts said the connections Figueres forged must be maintained and strengthened as the U.N. process now shifts from getting an agreement to implementing and building on it. Jake Schmidt, director of the International Program at the Natural Resources Defense Council, said the new phase means that different skills will be needed. Figueres, he noted, took the helm of the UNFCCC when the disappointment of Copenhagen was still fresh. "Christiana needed to elevate the discourse again, make sure that world leaders knew they needed to come back to the table after Copenhagen," he said. "We're in a very different world now." The new climate chief, he said, must be someone who can "do the heavy lifting" to ensure that the world sticks to the itinerary set in Paris -- a stock-taking in 2018, followed by countries' revising or resubmitting their pledges and coming up with proposals for deeper decarbonization by 2020. What's needed, said Schmidt, is "somebody who's a little more like a bureaucrat worker bee rather than a spokesperson." "Christiana was the face for international climate," he added. "I'm not sure you need that same role this time." But David Waskow, director of the World Resources Institute's International Climate Initiative, said that it will still be important for the executive secretary to communicate the importance of climate action to an audience that is broader than the deeply immersed community of negotiators and stakeholders who show up at the annual UNFCCC conferences. "Christiana had the virtue of being both passionate and diplomatic all at once, and I think that is still the sort of mix that's needed," he said. Developed or developing country chief? Following the demise of the Copenhagen talks, many leaders felt it was important for the UNFCCC to be headed by someone from the developing world. As a citizen of Costa Rica who had lived in the United States, Figueres spanned both worlds. This time around, it is less important where the next executive secretary comes from, experts say, as long as he or she understands the needs of a wide range of nations. Saleemul Huq, director of the International Centre for Climate Change & Development in Bangladesh, said that while he would generally prefer a candidate from the developing world, he likes Pásztor best of the early candidates discussed because of his experience and skill set. "He has been a key inside player on behalf of the secretary-general (who himself has been a key political figure) in getting the result in Paris over the last year leading up to COP 21, and hence would hit the ground running as we move towards implementing the Paris Agreement," he said. The success of Paris was a vindication of the UNFCCC as the world's most significant multilateral process on climate change. But with a global treaty in hand, some observers worry that the post being vacated by Figueres will be perceived as less of a challenge and opportunity than it was six years ago. Schmidt proposed the analogy of trying to recruit a captain for a World Cup-winning soccer team after the tournament has been abolished. "Who wants to be captain when there are no more World Cups?" he said. But observers say Figueres has taken steps to help recruit top talent by lobbying the secretary-general to elevate her post to the higher undersecretary-general level, confirming that it will remain a position of prestige within the U.N. hierarchy. U.N. sources say the elevation has long been in the works and will remain in effect after Ban steps down as secretary-general at the end of this year. "The secretary-general's decision to raise the level of the post of executive secretary to that of undersecretary-general reflects the evolution of the UNFCCC process and the enhanced scale and scope of the responsibilities of the post," said U.N. spokesman Dan Shepard. Ban's departure poses even more questions for the future of the U.N. climate process than Figueres' does, Wirth said. The secretary-general has prioritized climate change and can rightly claim Paris as part of his legacy, he said. If his successor is less interested in the issue, the new executive secretary will have to advocate for it. "Without a secretary-general who's committed, you can't get from there to here," he said.